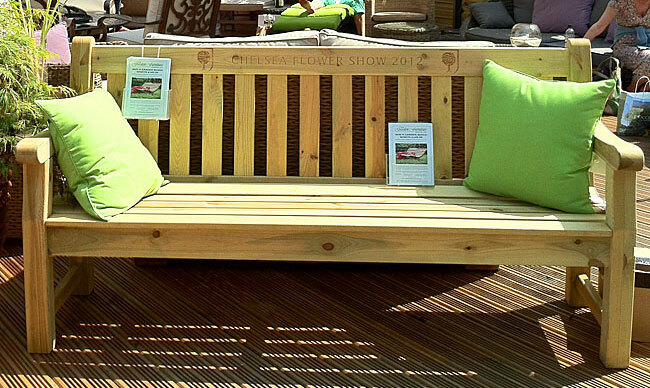 There's a multitude of choices available in wooden garden benches but in the next few weeks customers will be able to personalise any new bench purchase. Benches.co.uk specialises in supplying only high quality benches and now plans to offer state-of-the-art laser engraving to many of its products. Customers will have the options of creating a personal message and/or uploading an image or logo of their choice. The laser machine is capable of millimetre precision and the results are truly amazing. There are a number of outdoor wooden garden benches that can make a real impact when a special message is a must. By creating a personal message it can give that little bit more pleasure perhaps bringing back fond memories or a special place. The above rose bench perfectly shows what this engraving machine is capable of. 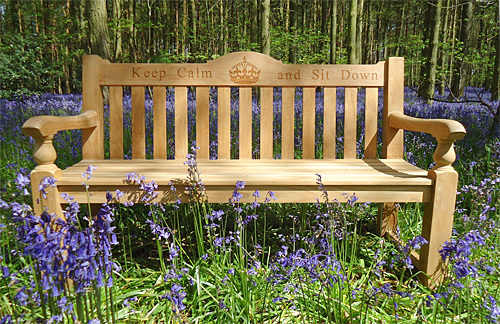 This particular bench was the highlight of a recent exhibition at the RHS Chelsea Flower Show 2012 with its inscription of "Keep calm and sit down". The crown engraving also shows the accuracy and bespoke nature of the customisation that will be possible. The detailed yet simple design of the Rose Bench gives it an imposing prominence wherever you might decide to place it. It is strong, comfortable and very durable. The Darwin Bench is one of the most popular wooden garden benches in the entire range. It's affordable, has clean lines and equally important it is FSC approved. The Darwin Garden Bench is kiln dried and pre-treated to category 3, giving it a ten year plus life span. This is a high quality bench providing real value for money. The bench comes in at a generous 1.8M making it suitable for larger garden, parks, public areas, picnic spots, corporate locations and staff relaxation areas. For all your wooden outdoor bench needs visit now and ask about the laser engraving options and unique choices available.